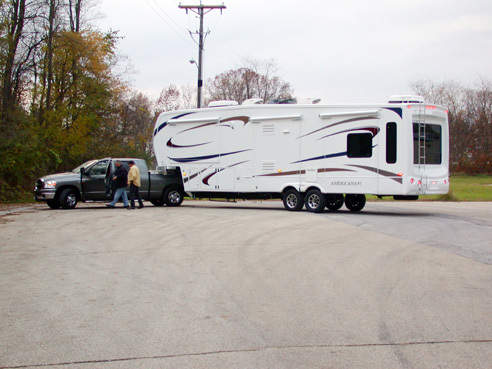 Prior to towing instruction and review, our Jerry Lemar discusses planned tight maneuvering with Jeff and Sue Gunn near theAmericana upfitting shop in Elkhart. The Gunn's (who headquarter in Southern California) tow vehicle is a Dodge 3500 Diesel mega-cab short-bed. 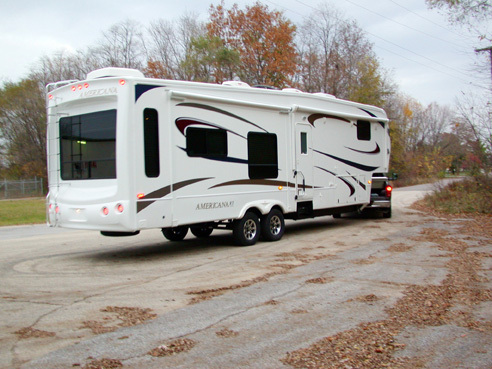 Our upfitting center installed a Super Glide sliding hitch which moves the fifthwheel toward the rear, during tight turns, avoiding contact with the back of the cab. 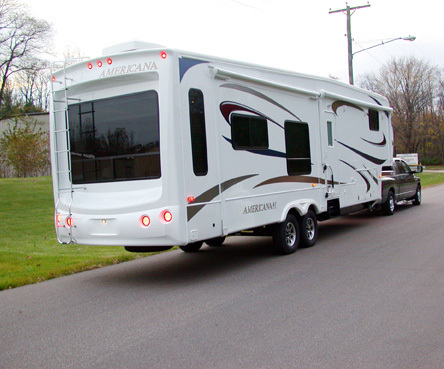 As the tow vehicle and the Americana straighten out, the hitch cams the load forward to the correct, king pin over rear axle towing position. Backing along a straight line, using mirrors only. This is an important exercise to learn and prepare for backing into parking spaces. Backing straight involves a succession of turns and like learning to ride a bike, practice makes prefect. After a while backing becomes smooth and almost automatic. The bright LED lights can easily been seen by traffic. Fifthwheels can get in and out of very cramped spaces. 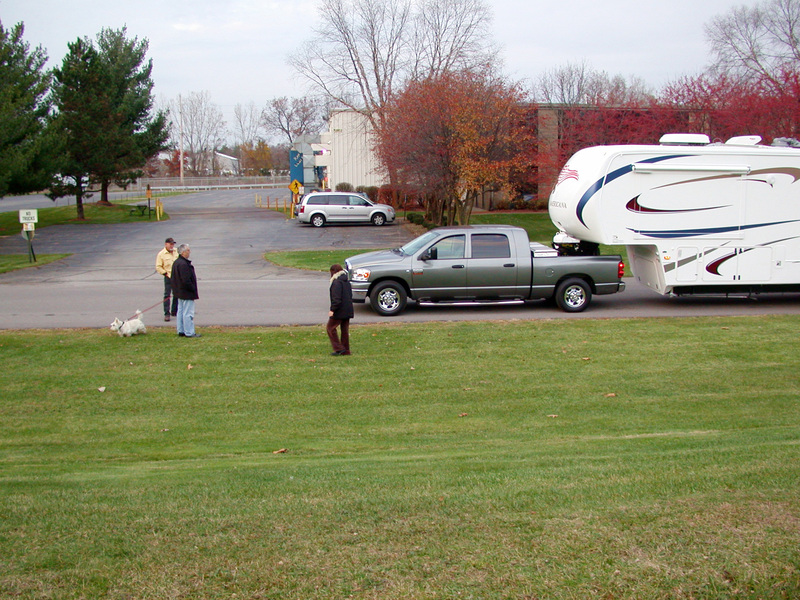 90° turns are a key to the fifthwheel tight maneuvering “magic”. Here Jerry has Jeff Gunn out of the Dodge to look at the physical position of the truck and Americana while he starts to backup to enter a 90° turn and departure in the opposite direction. Jerry will now have Jeff drive forward while reversing his steering wheel and slowing drive out in opposite direction from the approach. 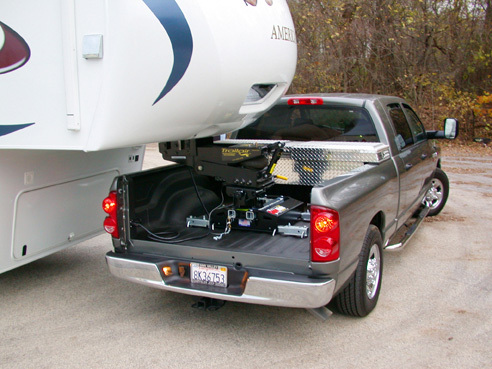 The optional Trail-air air-ride kin pin box clears the inside of the pickup’s bed. However, we caution our customers that installing several of the hard railed tonneau covers can sometimes cause rear of the king pin box clearance difficulties. After Jerry’s towing instruction, Jeff felt comfortable enough to head back to California Jeff did have motorhome driving experience. Below is the text from an email just received from the Gunns. Hi Russ - Thanks for the photo. We agree that it is a beautiful coach and the Cherry wood really sets it off. We really enjoyed the experience of coming to Elkhart and going through your "shake down" program. The truck and coach are well balanced and literally glide along and are a pleasure to drive. I am writing this from Elk City, OK on our second night on the road to our home in Southern,CA. Please pass on our thanks and kindest regards to Jerry, Ron and the crew in Elkhart. A memorable experience!